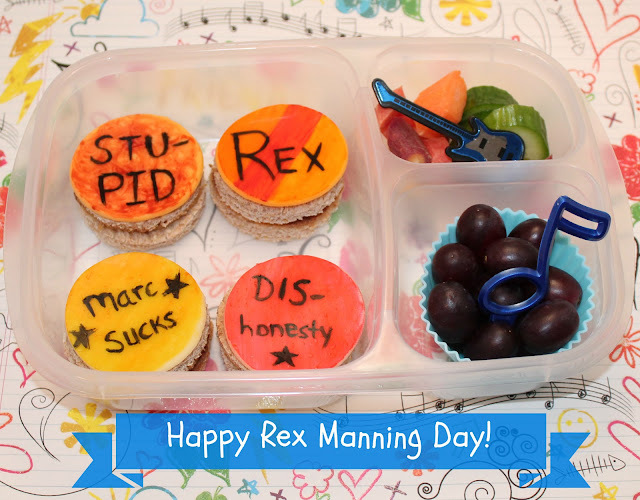 Bento for Kidlet: Happy Rex Manning Day! My all time favorite movie is definitely Empire Records. If you have never seen this movie you must see it immediately! It's amazing. Luckily for me some of my Edible Geekery buddies are also big old nerdy fans of the movie! Yay! So we're having a little blog hop to celebrate the fact that today is Rex Manning Day! Kidlet loves this movie right along with me so I know he will love this surprise lunch for tomorrow! Since we are doing some rearranging of furniture it will be nice to not have to worry about fixing lunch. And then he can enjoy the fun without worrying about it possibly being inappropriate for school. And now go see what my buddy Cristi at BentOnBetterLunches has for you on this most auspicious occasion! Love this hop...wish there were more in it! Doctor Who: Impossible Astronaut Day! Pillsbury Artisan Pizza Crust Giveaway! Doctor Who Fish Fingers and Custard Day!